Aidan with his eyes open! Aidan waking up on Vecuronium Holiday! 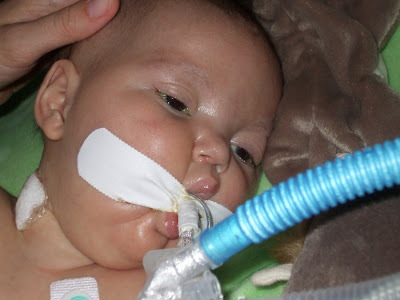 you are helping us by reading our blog, commenting and praying for Aidan. You are NOT a stranger. Barb invited you and we are asking you to stay and please don't feel like a stranger. Laura your voice is so sweet--- You guys are so strong-- I wish I could be there when he wakes up just to see you guys so full of joy :) Please give him a kiss for me and tell him I love him! Please email me with your address there! finally, I figure out how to send you a message. I miss you guys. Thank you for the wonderful pictures of Aiden. He holds a special place in my heart. I will continue to pray for all of you. A lots of kisses and hugs.